“Vekhand medicinal root is a low maintenance crop. It grows naturally and incurs very low production cost. It is an excellent insect and pest repellant as well as restores the soil fertility. This root has the ability to reduce the production cost to minimum due to its medicinal properties,” highlights Mr. Rajesh N Gaidhani, turns farmer leaving corporate job of 26 years. 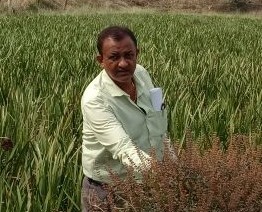 Mr. Gaidhani’s farm is located in Lakhani village, Bhandara district, Maharashtra. It is a 16 acre farm in which 8 acre was inherited and other 8 acre was purchased. It is 100% chemical-free farm. Speaking about turning the farm organic he says, “I absolutely had no idea about crops or cultivation process but I had decided neither to grow only conventional crops nor follow the conventional farming practices of using chemical based agri inputs irrespective of drop in the yield. 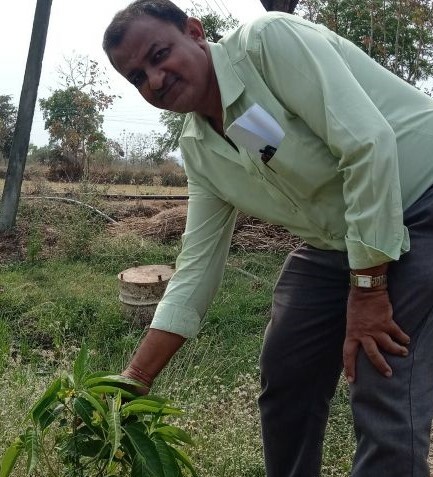 On researching the non-conventional crops suitable for the soil, water and climatic conditions I selected five medicinal plants out of which Vekhand roots were the best choice. Now as by nature medicinal plants are grown without any use of chemicals thus rest of the farm where I was growing food crops also became organic in the process. Finally entire farm became 100% organic,” he explains. The farm was started in 2013. “When in job, being in purchase department I used to travel extensively across India and used to come back home in village on break 2-3 times in a year. I found this India (rural) and that India (urban) to be totally different. It is a complete mismatch! Life in cities is very comfortable with all amenities and good income on the contrary life of rural people mainly farmers is pitiful. I used to feel sorry for the farmers for a very long time but then one fine day I quit the job and next day became farmer. I left the cushy job because only after becoming farmer I can help other farmers,” he shares the reason for leaving the job paying annual package of Rs. 19 lakh/annum and starting from scratch in farming. The farm is gifted with immense water as it receives heavy rainfall thus all the crops grown are those that require more water. Initially the planting material of Vekhand root was bought from Jabalpur, Madhya Pradesh, “Later its gets multiplied. First on experiment basis I grew the roots only in 1 acre area in 2013. It grew well and gave good returns hence in the next season I cultivated in 3 acre, then 6 acre and presently it is grown in 8 acre,” asserts Mr. Gaidhani. Vekhand root (botanical name Acorus Calamus) is a one year crop, sown during monsoon as it requires lot of water for its growth. “The ideal time for sowing the root rhizome is June. The plantation method is same as sugarcane. One foot high beds are made in the farm keeping the distance of one foot. On each bed the rhizomes are sown 9 inch apart. Approximately in one acre 20,000 plants are accommodated that yields 1000-1200 kg roots,” he elucidates. Post harvesting the left behind plant is either mulched back in the soil or decomposed to prepare the bio-solution. Farming inputs used in the farm are vermiwash, vermicompost and in-house prepared farm yard manure and bio-pesticides using Vekhand plant waste and roots respectively. Ayurvedic medicine manufacturing companies are the buyers for dried Vekhand roots. Demand of the root is high and stable in the market but the root is subject to extreme price fluctuations. “In the first year I sold dried Vekhand roots in the market but I strongly believe cultivation and selling the raw/dried farm produce at the first stage stagnant the growth of a farmer therefore value addition is important for scaling the operations and increasing the revenues. Proceeding with the same mindset I did some R & D on Vekhand roots. As it is good repellant I made powder and extract from its roots. The powder proved to be excellent for preserving edible food commodities while the extract performs extremely well as crop protection solution. It is used as bio-pesticide, bio-insecticide and bio-fungicide in the farm to protect food and horticulture crops from all sorts of pest attack,” highlights Mr. Gaidhani. Crop rotation is must for this medicinal plant. “In my farm I keep rotating the crops so that soil restores the nutrients. Other crops grown are local varieties of paddy, wheat, Bengal gram, moong etc. After harvesting Vekhand roots the soil becomes fertile thereby in the next season other crops gives bumper yield for example last season wheat production was 900kg/acre. This is the reason I get high production of all crops,” he affirms. 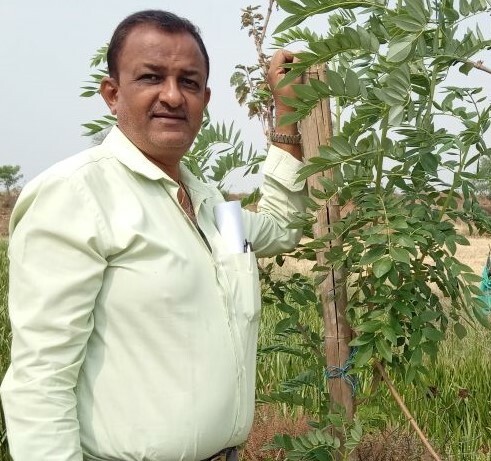 To identify buyers for Vekhand root Mr. Gaidhani suggests participating in the meetings and conferences organized by National Medicinal Plant Board, “It definitely helps in building new contacts and is gainful for latest updates in the industry,” he states. Other farm commodities like rice, wheat, pulses etc are processed, packed and sold to direct consumers. “Buyers for these products come in touch with me through word of mouth publicity.” Price for food items is reasonable where only 20% premium is charged. In time to come, Mr. Gaidhani’s farm produced food items shall be available on websites and online store. “I also plan to explore farming potential of aromatic rice ‘Chennur’. It is the specialty of our region and has huge market. I intend to work with the farmers for this crops as well as Vekhand roots. It shall surely improve their livelihood,” he reveals. Mr. Gaidhani is hopeful India shall have bright future as, “I see many young people interested in organic farming. If this keenness for chemical free farming continues then we surely will have best quality of water, air and soil in our country. Sooner or later we have to adopt organic farming because land quality needs to improve then only we will be able to give land to next generation and not stones!” he signs off.